Welcome to Part 2 in my series about launching kids chess club, and becoming the hero of your kids’ school. Part 1 described the ridiculously inflated cost of after-school activities, and how chess is the alternative with the highest rewards – for your kids and everyone else’s. My boy and girl were lucky enough to have a phenomenal chess club at their school, already in place years before we arrived. When I took over to run things, I discovered the intricate workings of this well-oiled machine, and what makes it tick. Here’s the break-down. The parent coordinator is in charge of collecting payment and registration forms from parents, paying the chess teacher, buying supplies, communication with school teachers, principal, and parents. The parent coordinator is a volunteer. This is where you need support from the school principal. It’s challenging to get access to classrooms outside of school hours. The classroom teachers don’t want their stuff messed with, or kids rifling through their desks. However, the ideal environment is a classroom. Classrooms are carpeted and kids love to sprawl out on the floor and play chess that way. Befriend a nice, low-key teacher that would volunteer her classroom once per week. Do this prior to meeting with the principal. Another top choice would be the school library. The lunchroom is loud and pretty much the worst place to play chess. But take what you can get. 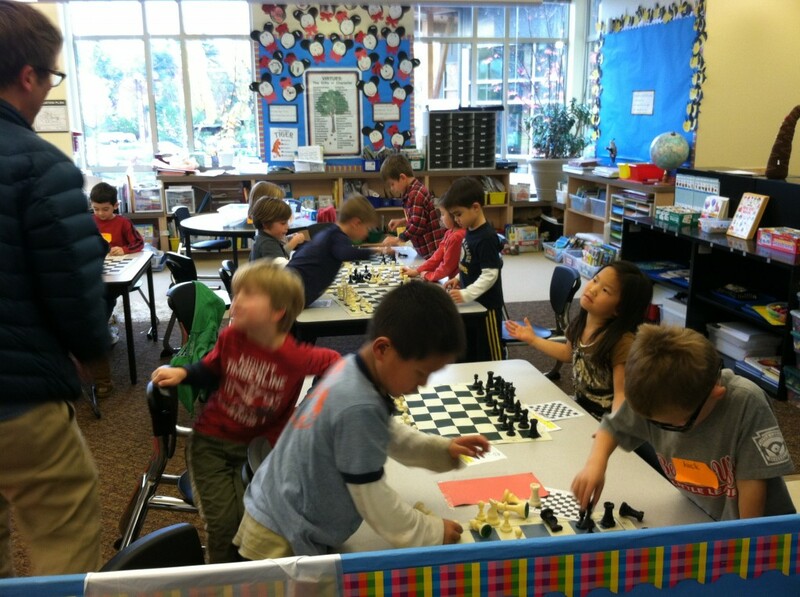 You might need to convince your principal to allow an after-school kids chess club. Not everybody gets it right away. You’ll need one board for every two kids. The best kids are the standard roll-up vinyl tournament boards with plastic pieces like this. You need one hanging demonstration board. Most of the time, the chess teacher/coach will have one. The ones with the little plastic pockets seem easier to use than the magnetic kind. If the person is also a chess master, you just found a rare treasure, like a rainbow unicorn. Don’t worry about seeking out a master. The goal here is to get your kids chess program going. So don’t get caught up in the idea of a perfect teacher. In time, you can bring in better teachers if necessary. 1. Reach out to your local adult chess club. 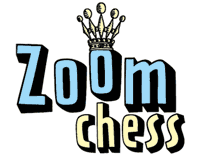 If you have a local internet or other adult chess club that plays as a team, GOLD MINE. Because even if these guys/gals aren’t available to teach your kids chess at 3:00 in the afternoon, they have a network of other players. You want to tap into this network. 2. Ask around to your Facebook friends, your grandma’s bridge buddies, and church, to find a smart, chess-playing retiree. 3. Does your local high school or university have a chess club? This could be an excellent choice for coaching prospects. Every room occupied by chess needs to have at least two adults at all times: one is a chess coach, and the other is a parent volunteer. The simple way to handle this is to have the same parent attend chess club each week. The more complicated way, but quite effective, is to rotate parents every week. When parents share volunteer duties, they get more involved an interested in chess for their kids. 1. You rely on school district funds, like I.S. 318 in Brooklyn New York. The trouble with this approach is that you are at the mercy of the availability of ongoing funds from one year to the next. If you go this route, be prepared to lobby aggressively to school administrators, and don’t give up. Charging a modest tuition for kids chess club is absolutely fine. You’ll get a better response if chess costs the same as daycare at your school, or if it’s priced less than other after-school programs. *The buffer gives you some extra money in the budget for incidental expenses like snacks/treats, equipment. The buffer needs to be bigger for teams that are traveling and playing at state tournaments. You might get a coach that volunteers his/her time for your kids chess club. Chess coaches should not be volunteers. Parents should be volunteering, and their job is to help out, circulate the room, or corrall kids, and maintain order in the classroom. Coaches have a different role – they are in charge of the teaching and curriculum. It’s smart pay your coaches something, even if it’s only $40. It provides incentive for the chess coach to consistently show up and teach well, and acknowledges the valuable service they are providing the kids. The top coaches in the US market are earning $200-$300 per session, but these chess coaches are the exception. Part 3 of this article will discuss what happens during chess club, curriculum, handling tuition, getting people to sign up, and more… Stay tuned! And please post your questions in the comments section. This entry was posted in How-To, Parent as Teacher, Uncategorized. Bookmark the permalink. Love your series on school chess clubs. I started one at my school right after I was hired to teach there, Now it’s 9 years and 43 team tournament trophies later. That’s not even counting the trophies our kids won for their individual scores. And guess what? Like you, I’m not a chess master either. But just like you’ve recommended, we do have a chess coach, and he IS a USCF national master and a certified scholastic tournament director. This year we added a volunteer who’s a retired mathematician, and a top local amateur player. Our principal just got funding to purchase a locking trophy case that sits by the office door. Very cool. All I would add to your suggestions is to check out wholesalechess.com – they have great prices on basic tournament size chess sets, quantity discounts, and free shipping over $100. We buy 20 sets every fall, and pass the savings onto parents. I recommend the quality solid plastic set that comes with a thicker vinyl rollup board and a carry bag with handles and a loop for the board. Let me know when you publish the next article (#3?) in your series. Thanks! Good question, Andrew. A session for beginner to intermediate is typically one hour of instruction, plus a few minutes on each end for setup and tear down. Advanced kids have a longer class, closer to 1.5 hours, with a master coach and higher tuition. Very interesting Jill! Curious, in your tuition formula what is a typical length of time for a “session”?